I have an older Mac computer. Apple tells me it will run OS thru El Capitan. It is currently running snow leopard 10.6.8. When I open "http://iTunes.apple.com/app/os-x-el-capitan/id1147835433?mt=12" I go to the Apple App Store and it says this is the El Capitan download. There is a blue button on the left side of screen under the large X that says "Get". If I click on this blue button, the button changes shade of blue as long as I hold the mouse button down, but nothing happens. If I click on the down arrow on the right side of the blue button, I get two options, "copy link" and "tell a friend". How do I download El Capitan? I called Apple tech support (tier 2) and spend several hours downloading to 10.6.8, but Apple can not tell me why I can not download El Capitan from the App Store. Any help appreciated! If neither of the "direct" App Store links (1. El Capitan 2. El Capitan) as described in other answers like this one work, you can try to trick App Store - as elaborated here: Install OS X El Capitan on Mac Direct Download. Here a local web server with all necessary files mimics the remote but stubborn Apple server. Enter sudo killall -HUP mDNSResponder to flush the DNS cache. in the address field of your browser. The file should be "downloaded" with a high download speed. Delete the downloaded file afterwards. 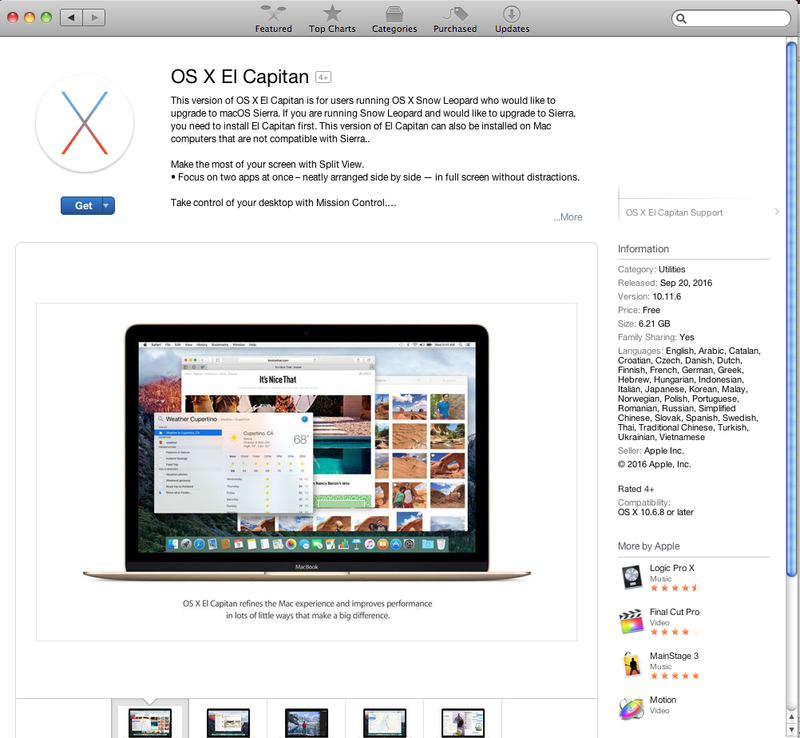 Launch App Store.app, go to the El Capitan page or your Purchased tab and download OS X El Capitan from there. The OS X El Capitan Installer.app should be "downloaded", compiled in /Applications/ and launched. Quit the OS X Installer for now. Quit App Store.app. and remove the line 127.0.0.1 osxapps.itunes.apple.com. So I had this exact problem as well, and it seemed to work just fine after installing all available software updates from the  menu. Not the answer you're looking for? Browse other questions tagged el-capitan snow-leopard upgrade mac-appstore . How to can I upgrade Xcode 4.1 to 4.5.2 properly?